Difference between revisions of "EMF Search"
The project has been "inactive for many years" and is scheduled for termination. See [http://wiki.eclipse.org/Modeling/project_termination_review_2012#Search]. Project website is at [http://www.eclipse.org/emft/projects/search/#search]. EMF Search is an Ecore meta-model based extensible search engine which purpose is to provide users query launching services against Ecore based models. Meta-model based search is basically being able to take advantage of a meta-model structure to run generic search queries onto it. This means that a meta-model structure, defining a minimal modeling "organizaton", contains information enough to get operations applied to it, and by extension having same operations applied to any inheriting model compliant with this meta-model structure. Ecore based search is in fact a particular case of meta-model based treatment, a typical approach also known as Model Driven Architecture. Meta-model based search is basically being able to take advantage of a meta-model structure to run generic search queries onto it. This means that a meta-model structure, defining a minimal modeling "organization", contains information enough to get operations applied to it, and by extension having same operations applied to any inheriting model compliant with this meta-model structure. Ecore based search is in fact a particular case of meta-model based treatment, a typical approach also known as Model Driven Architecture. In other words, this allows to develop meta-model based generic algorithms, valid across any user defined model extending elements & structure of a given meta-model. Such method are usually employed as part of a code generation development process also known as Model Driven Development, allowing developers to code things once, setting up templates based code generation getting its data from the particular valuation of an instance of a given meta-model (eg: An actual user defined model or domain model populated with pertinent data). For model search explanatory purposes, we need to introduce some terminology. First at all, lets keep in mind a model search query always need to deal with entities such as a scope of model resource(s)/element(s) onto which a search query will apply, a set of participant meta-elements which the search query will consider, and finally a search query, textual, scriptical,programatic which an associated model search engine will evaluate against a scope and participants. This evaluation obviously having the role to produce Model Search Results. For model search explanatory purposes, we need to introduce some terminology. First of all, let's keep in mind that a model search query always needs to deal with entities such as a scope of model resource(s)/element(s) onto which a search query will apply, a set of participant meta-elements which the search query will consider, and finally a search query, whether textual, scriptical or programmatic, which an associated model search engine will evaluate against a scope and participants. This evaluation obviously having the role to produce Model Search Results. This brief explanation just made main concepts appearing : Model Search Scope, Model Search Participants, Model Search Query, Model Search Engine, Model Search Results. This brief explanation just made main concepts appearing : Model Search Scope, Model Search Participants, Model Search Query, Model Search Engine, and Model Search Results. (see org.eclipse.emf.search.modelSearchEngine extension point definition). (see <code>org.eclipse.emf.search.modelSearchEngine</code> extension point definition). to evaluate a model search query applying only on a set of selected meta-elements (called meta-elements participants). EMF Search offers extensible model search queries mechanism. to evaluate a model search query applying only on a set of selected meta-elements (called meta-element participants). Users can contribute model search queries potentially combined with any numbers of diferent elements particpants. and the, associating it to an existing model search engine. EMF Search offers extensible model search participants elements mechanism. EMF Search offers an extensible mechanism for model search queries. Users can contribute model search participants potentially combined with any numbers of diferent model search queries. model search participant elements (plus the way to handle it from UI point of view) and, associating it to an existing model search engine. Users can contribute model search queries potentially combined with any number of different element participants. Model Search Scope stands for a set of ecore resources to be considerer by the search query. (eg. given the fact that different user defined elements extend Ecore meta-elements). As a result, users can register to <code>org.eclipse.emf.search.modelSearchID</code> extension their own model search queries (plus the way to handle it from the UI point of view) and then, associate it to an existing model search engine. We can make a comparison with platform search concepts from the scope point of view. selected projects or even given working set. Query evaluation produces matches, being collected in a result object or each resource evaluated. Matches can be considered as reult entries of top level reult object. These matches are considered as Model Search Result and will populate the Eclipse Search View. Users can contribute model search participants potentially combined with any numbers of different model search queries. As a result, users can register to <code>org.eclipse.emf.search.modelSearchParticipantTab</code> extension their own model search participant elements (plus the way to handle it from the UI point of view), and associate it to an existing model search engine. Model Search Scope stands for a set of ecore resources to be considered by the search query. As in the text search or java search, a user can search into the whole workspace or reduce its scope to selected resources, selected projects or even a given working set. Matches can be considered as result entries of top level result object. Textual queries are very similar to JDT, PDE or File ones. Query evaluation is done against meta elemnt names as users can see in Ecore editors. Thanks to the fact Most Ecore elements are inheriting from ENamedElement, exposing a usefull getName:String method, it is possible evaluate regex pattern against them. OCL queries for Ecore are simple OCL invariants evaluations, these queries are ran against a particular meta element. before being able to edit the invariant body. As a result an OCL query expression body can take advantage of syntax coloring & contextual completion proposal. Ecore Textual Search Page is composed of two parts : query & participants. The figure below depict a user textual query against selected participant meta elements. Here, the user want find all EClass elements with name matching "Movie*" regex. Note that the search scope can be chosen between Workspace, Selected, Resource, Working Set. query configuration in terms of expression, participants and scope. number of match occurences their sub tree owns. OCL queries for Ecore are simple OCL invariants evaluations, these queries are ran against a particular meta element. OCL contextual edition is allowed according to a meta element user selection. Thus, users wanting to evaluate invariant expression against an EClass would have to set the OCL Expression wigdet context set to 'EClass' before being able to edit the invariant body. Below we can see the completion proposal list obtained by hitting "Ctrl+Space" from the OCL Expression widget. Results are collected and displayed accordingly to the resource & OCL invariant they have been evaluated against. Replace infrastructure is offered. It allows users to replace a match occurence by a given text. Normal & Case Sensitive queries replace the whole matched occurence. Regex queries replace only the region matched with given text. It is planned to improve replace infrastructure to offer full regex replace support. Once, user gave a new value to replace occurences with, a dialog pops up proposing to apply or not changes. UML2 Search is a kind of enhanced sample example demonstrating extensibilty of EMF Search framework. It has same features has Ecore ones by extesnion and add some UML specific ones. Textual queries are against NamedElement objects. OCL Queries are ran against any ModelElement. Results are collected in a dedicated result page, offering custom actions and navigation. GenModel is basically an Ecore model for Ecore generation. Thus, it was a natural candidate for an EMF Search integration. GenModel elements are pretty similar to those defined in Ecore meta model. Search page has a simple textual expression area. 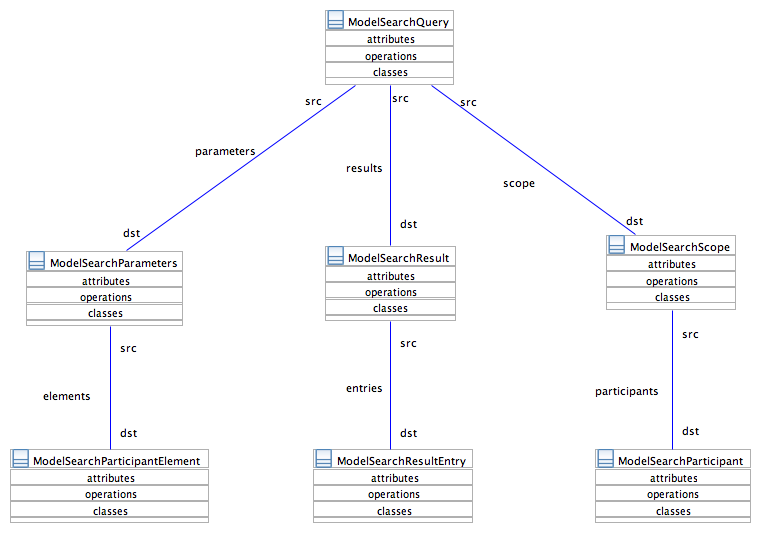 GenModel extension of the EMF Search framework is very similar to the UML2 one. They are all inheriting from the Ecore one. Results are displayed in a very similar form than Ecore or UML2 ones. Results allow to perform code generation actions as in the EMF genmodel legacy editor. GenModel owns information enough to generate code *AND* navigate to source. User can come back to legacy Ecore editor at any time. Developers have several levels/contexts/persitences configurations for which they want to use EMF Search. Depending on these particular situations, EMF Search typical usages exist. The project has been "inactive for many years" and is scheduled for termination. See . Project website is at . EMF Search provides the fundamental infrastructure and components for search queries on EMF based models. A particular focus is made on integration with the Eclipse Core Search API for end user tight integration. EMF Search has an extension point allowing a user to contribute custom model search engines (see org.eclipse.emf.search.modelSearchEngine extension point definition). A model search engine has responsibility, given a model resource scope, to evaluate a model search query applying only on a set of selected meta-elements (called meta-element participants). Users can contribute model search queries potentially combined with any number of different element participants. (eg. given the fact that different user defined elements extend Ecore meta-elements). As a result, users can register to org.eclipse.emf.search.modelSearchID extension their own model search queries (plus the way to handle it from the UI point of view) and then, associate it to an existing model search engine. As a result, users can register to org.eclipse.emf.search.modelSearchParticipantTab extension their own model search participant elements (plus the way to handle it from the UI point of view), and associate it to an existing model search engine. We can make a comparison with platform search concepts from the scope point of view. As in the text search or java search, a user can search into the whole workspace or reduce its scope to selected resources, selected projects or even a given working set. Query evaluation produces matches, being collected in a result object or each resource evaluated. Matches can be considered as result entries of top level result object. These matches are considered as Model Search Result and will populate the Eclipse Search View. This page was last modified 10:40, 27 September 2012 by David Rees. Based on work by Nicolas Bros, lucas bigeardel and lucas bigeardel.